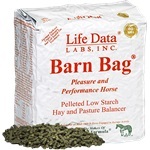 The Barn Bag® Pleasure and Performance Horse Hay and Pasture Balancer is a low calorie and low starch equine supplement that provides the horse a daily fixed amount of important vitamins, minerals, amino acids, and fatty acids. These nutrients are often lacking in the equine forage diet. Barn Bag® is a pelleted concentrated nutrient source that increases the feed utilization of the hay and pasture diet. Energy needs vary widely between horses and must be addressed separately from other nutrient requirements. When compounded feeds are used, the nutrients added to the feed are “force fed” into the horse at indiscriminant amounts in order to meet the calorie requirements to maintain weight. This leads to over-supplementation of hard keepers at their higher feeding levels and insufficient nutrient supplementation of easy doers. Hard keepers may require an additional calorie source in order to gain or maintain weight. Whole oats, beet pulp, or vegetable oil are the best options. 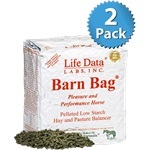 11 lb Bag Single Barn Bag Pleasure and Performance Horse Feed Con.